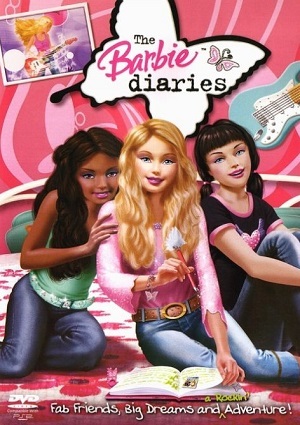 It is the story of the teenager Barbie and her friends with the high school problems that kids of that age have; everything happens when Barbie suffers a love disappointment because of Todd and decides not to be depressed about it. Almost magically, a woman gift to Barbie a bracelet and a diary, she decides to write about her dreams and desires. Barbie will be surprised when she realizes that as she writes in the diary her luck changes gradually. At school she becomes more popular, her rock band win contests, Todd apparently is very interested in her again, to summarize, after writing in her diary things look far much better. Barbie has everything she had wanted!! But Barbie is gradually distancing from her true friends by putting more attention to her new life, and realizes she is changing her personality and way of being. Barbie suffers about it and doesn’t know what to do, but her true friends will make her see the true meaning of her actions. Is it really that powerful Barbie’s Journal? Are Todd and Barbie finally perfect for each other? Both will receive a beautiful lesson of love in this movie that you shouldn’t miss.